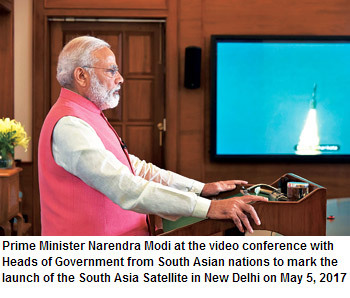 Prime Minister Narendra Modi tweeted ‘Launch of the South Asia Satellite shows that for South Asia, even the sky is not the limit for cooperation!’ Indeed, the sky is not the limit. While the Indian Space Research Organisation (ISRO) has shown its mettle to the world since many years, it has got an added boost with the government led by the Prime Minister, Narendra Modi. It was during the run-up to the Indian general elections in 2014, Prime Minister Modi had indicated that the foreign policy will actively focus on improving ties with the immediate neighbours. After the landslide victory in the general elections, Modi invited all heads of State/heads of government of SAARC countries to his swearing-in ceremony as the Prime Minister. 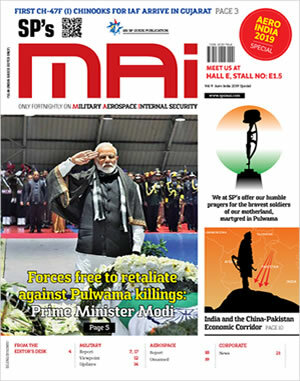 Space diplomacy has touched new heights with Prime Minister Narendra Modi’s unique gift in the sky to South Asian neighbours. The gift of a communications satellite for use by neighbours at no cost has perhaps no precedent worldwide. The satellite, which weighs over 2 tonnes, has been fabricated in three years at a cost of over Rs. 230 crore. Its footprint that extends all over South Asia. The South Asia Satellite has 12 Ku band transponders which India’s neighbours can utilise to increase communications. Each country will get access to at least one transponder through which they could beam their own programming. The satellite will facilitate DTH television, VSAT links, teleeducation, telemedicine and disaster management support. It will provide critical communication links in times of disasters such as earthquakes, cyclones, floods, and tsunamis. Heads of Government from all the seven South Asian nations who are benefiting from the satellite, connected via video conference, in a unique celebration of the successful launch. And ISRO, as is its prowess, showed that it could rise up to any occasion. In 1975 India became the first South Asian nation to launch a satellite. The ISRO Chairman, A.S. Kiran Kumar had stated that the satellite can be launched within 18 months of receiving approval from the SAARC member nations. 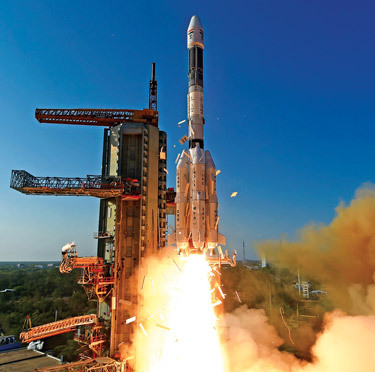 It was proposed to build a satellite with 12 Ku-band transponders (36 Mhz each) and launch using the Indian Geosynchronous Satellite Launch Vehicle (GSLV) Mk-II. The total cost of launching the satellite was estimated at Rs. 235 crore, and the cost of the launch to be met by India. The countries participating, besides India, are Bangladesh, Bhutan, Nepal, Maldives and Sri Lanka. These countries will only have to pay for their ground stations; all other costs are being borne by India. Instead of being called SAARC satellite it is called South Asia satellite as Pakistan and Afghanistan backed out of this venture, the former fearing that India could use the satellite for stealth surveillance. Afghanistan wanted more transponders as it has leased a satellite from Eutelsat and was going to place in the same longitude as GSAT-9. Nepal has also plans of acquiring two communications satellites of its own. Bangladesh signed into the pact only recently. It was worried about a clash in frequency allocation with its impending Bangabandhu 1 communications satellite. However on March 23 this year, ahead of Prime Minister Sheikh Hasina’s visit to India, Bangladesh signed up for the programme. As regards Sri Lanka, it signed up after India agreed to not prevent it from launching its own communications satellite in the future. In this background, the May 5, 2017, launch of the 2,230 kg South Asia Satellite GSAT-9 into a Geosynchronous Transfer Orbit (GTO) is historic. 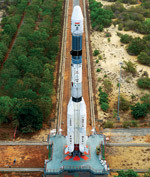 The GSLV-F09 mission is the eleventh flight of India’s Geosynchronous Satellite Launch Vehicle (GSLV) and its fourth consecutive flight with the indigenous Cryogenic Upper Stage (CUS). The vehicle is designed to inject 2-2.5 tonne class of satellites into GTO. The overall length of GSLV-F09 is 49.1 m. GSLV-F09 was launched from the Second Launch Pad (SLP) at Satish Dhawan Space Centre SHAR (SDSC SHAR), Sriharikota, the space port of India. GSLV-F09 vehicle configuration including the CUS is similar to the ones successfully flown during the previous three missions â€“ GSLV-D5, D6 and F05 â€“ in January 2014, August 2015 and September 2016 respectively. GSLV-D5 and D6 successfully placed two communication satellites â€“GSAT-14 and GSAT-6, while GSLV-F05 placed India’s weather satellite INSAT-3DR, in the intended GTOs. S-band telemetry and C-band transponders enable GSLV-F09 performance monitoring, tracking, range safety/flight safety and Preliminary Orbit Determination (POD). GSAT-9 is configured around the ISRO’s standard I-2K bus. The two solar arrays of GSAT-9 consisting of Ultra Triple Junction solar cells generate about 3,500 Watts of electrical power. Sun and Earth sensors as well as gyroscopes provide orientation reference for the satellite. The Attitude and Orbit Control System (AOCS) of the satellite maintains it’s orientation with the help of momentum wheels, magnetic torquers and thrusters. The satellite’s propulsion system consists of a Liquid Apogee Motor (LAM) and chemical thrusters using liquid propellants for initial orbit raising and station keeping. The satellite also carries plasma thrusters, assisting in station keeping. India’s advancements in space are highly commendable and the neighbouring countries can benefit from it. India can also share the know-how and knowledge from its Indian Regional Navigation Satellite System (IRNSS), the GPS-Aided GEO-Augmented Navigation (GaGAN) networks and the CartoSat imaging satellites, while ensuring that it does not compromise with its own strategic interests. Regional cooperation has gone on to a higher level!